Until approximately 1800, only wealthy noblemen and the church could afford music performances - apart from folk music, musical activities were almost exclusively tools for worship and representation. This changed when musical instruments and music lessons became more affordable in the 19th century. The Wiener Musikverein society formed for a new aristocratic clientele: Successful businessmen and burghers. By approximately 1890, music had spread even further and became popular with the middle class. The traditional Musikverein suddenly faced competition - new and bigger venues were planned that would allow thousands of people to attend music performances and concerts. Music had become a mass medium. 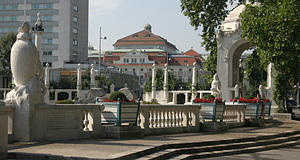 The Viennese architect Ludwig Baumann presented plans for a concert hall with an adjacent leisure centre in 1890. This plan was abandoned, but between 1911 and 1913, it was picked up again and adopted in a different context. This was done by the Viennese theatre architect Ferdinand Fellner in collaboration with Ludwig Baumann himself and the Hermann Helmer: The idea for the Wiener Konzerthaus was close to become reality. The Jugendstil building was finally opened in 1913 by Emperor Franz Joseph I. Upon the occasion, Richard Strauss composed a piece of music. In addition to the (then) modern composition, the 9th symphony of Beethoven was performed for the sake of the contrast between tradition and contemporary music. This tradition was continued when soon after the opening, composers like Arnold Schoenberg and Erich Wolfgang Korngold performed their work here. The new concert venue for Vienna was (and actually still is) 70 by 40 metres large at its base and today, it includes four concert halls: The "Großer Saal", which seats 1865 people; the "Mozart-Saal", which seats 704 people; the "Schubert-Saal" for 366; and the "Neuer Saal" for an audience of 400. The latter one′s name means "new hall" and is self-explanatory; it was only opened after an extension in 2002. The individual concert halls are completely separate and acoustically well-insulated; therefore, different concerts can be done simultaneously without interference. If you enter the building from its main gate, you can see an inscription above the door: "Ehrt eure deutschen Meister, dann bannt ihr gute Geister". This means "Honour your German masters, then you preserve good spirits". What could easily be mistaken as a line from the Polish national anthem is actually a phrase from Richard Wagner′s opera "Die Meistersänger von Nürnberg". Ironically, it was during the most German period in the history of the Konzerthaus - the Nazi years - that the repertoire was of the lowest quality. Only after the end of WWII, the Konzerthaus was used for "serious" music again - in addition to concerts of international pop music, probably for financial reasons. Today, the Konzerthaus is the main concert venue of the Vienna Symphonic Orchtestra (not to be confused with the Vienna Philharmonic Orchestra), the Wiener Kammerorchester (Vienna Chamber Orchestra) and the Klangforum Wien. It is also frequently used as a venue for touring orchestras, balls, large receptions and music festivals. An adjectant building is used by the Universtiy for Music and Applied Arts. There are lecture theatres and rehearsal rooms and well as some offices; most importantly, however, there is the "Akademietheater", a theatre with 521 seats - it serves as a side-branch of the Burgtheater and is well-known for experimental productions. Attractions nearby include the Belvedere Palace, the Stadtpark, the Museum of Applied Arts, the House of Music, the lower parts of the Ringstraße and the Botanical Gardens of Vienna University.